A couple of things I noticed. Some of the Tribal symbols are opposite of what you have in the legend. You will need to have them all the same way. i.e. 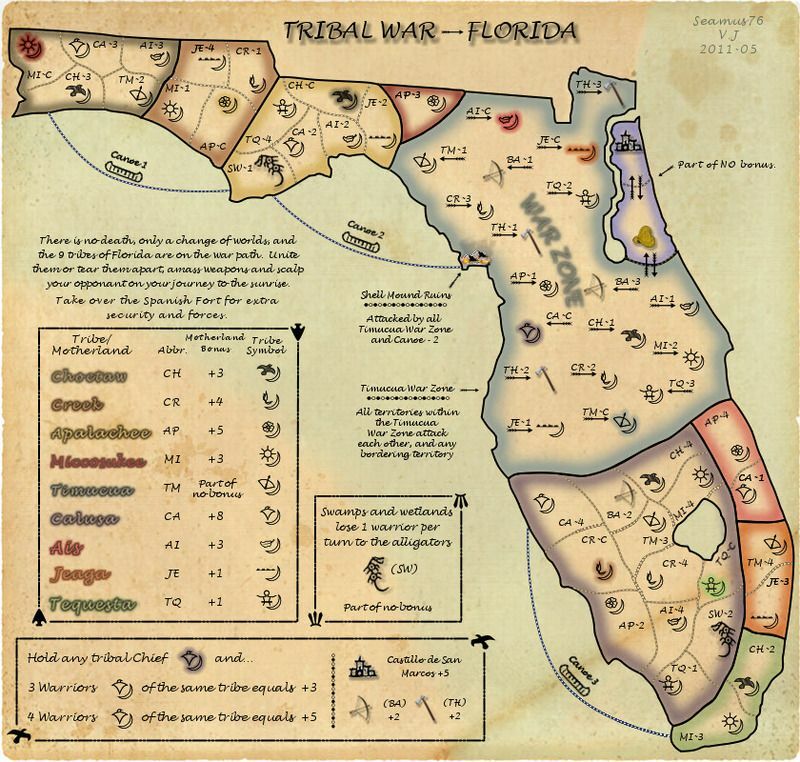 The Calusa Chief (War Zone) is flipped from what you show in the legend. There are others the same way. The border between CR-1, CH-C and TQ-4 needs to be moved as it looks like CR-1 can attack CH-C.
Other than these couple of things, looking good! Thanks isaiah. Those should be an easy fix. I didn't realize they needed to match the legend, but that makes sense. Seamus76 wrote: Thanks isaiah. Those should be an easy fix. I didn't realize they needed to match the legend, but that makes sense. Yes, it makes it consistent and easier to find and read. I flipped the symbols that had been reverse from the legend. Also fixed the border between CR-1, CH-C and TQ-4 so that it doesn't look like CR-1 can attack CH-C anymore. Thanks for the feedback! Keep it coming. the map now looks cleaner and much less cluttered than previously. adjust the zone bonuses so they make more sense: creek is worth at least the +3 of choctaw, or even +4 because all four regions are border regions, while the single miccosukee region has to be no more than +2. the sw-2 alligator doesn't work well if it's part of no bonus, since no-one has any reason to capture it from the neutral player, unless it starts with a single neutral troop. 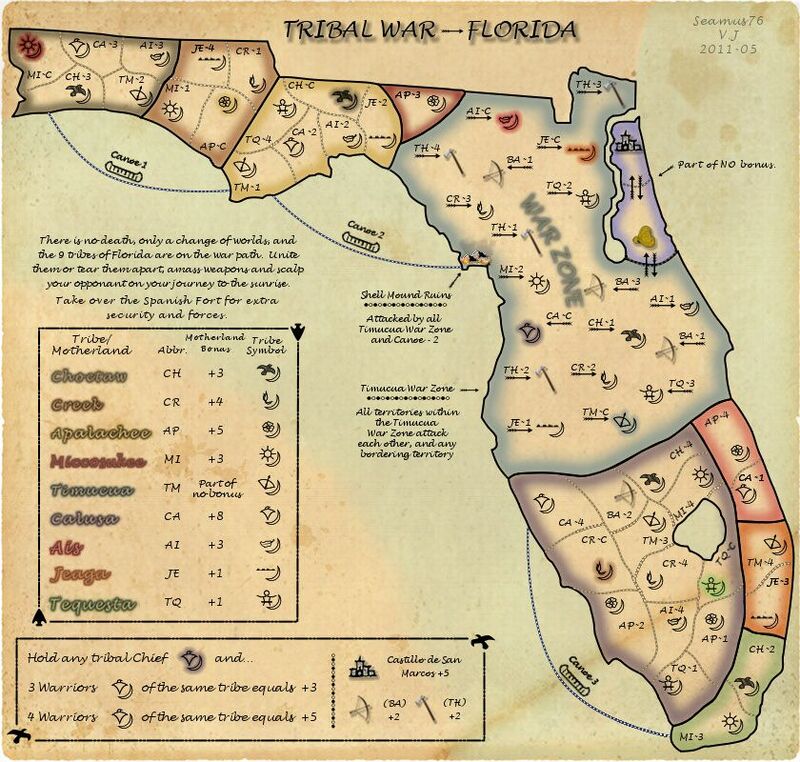 try making it part of the tequesta bonus zone, since that's the most isolated of the tiny southern bonus zones (and therefore the easiest to hold). make sw-1 a different colour from apalachee, so that it doesn't confuse players. aren't u going to differentiate the bow-and-arrow bonus from the tomahawk bonus (for example +1 for bow-and-arrow and +2 for tomahawk)? if u don't, then what's the point of having two bonuses? u might as well make all of them tomahawks! the warrior bonuses are a big improvement. I think you're right about creek. I'll make it +4, which makes more sense. The thought on the miccosukee region at +3 was that being a region bonus it looked better being more than the bow and arrow, and tomahawk at +2. I would love more thoughts on this, and any other bonuses. I'm not giving up on the swamps/alligators, but the map has come a long way since they were added, so what would be the thoughts on removing them and adding one more bow and arrow, and one more tomahawk to the map? A bow and arrow would be added to the war zone, and a warrior would be moved to SW-1. A Tomahawk would be added to SW-2. This removes one element that some folks had a problem with already. Thoughts? At one point early on that had been done, but it just didn't work right with the other bonuses, etc. I think now, while they are both the same bonus value, they each add a lot to the theme of the map, and personally I think that aspect is pretty solid from a looks and gameplay standpoint, but I would certainly lean on your expertise. Thanks for the feedback everyone, keep it coming. I updated the Creek bonus from +2 to +4, and made some minor cosmetic updates. More feedback please. Itching to work on this map, feedback please. - The outer glow on the tribes is too strong. While you're meaning to make them easier to read in a lot of cases it works against the script. Perhaps try fewer pixels in radius or a lighter color than black? - As cool as the Conquistador helmet looks, it's out of place as the symbol has no accompanying bonus value. With as many symbols as you have in play right now, that's going to add confusion as people scour the map looking for whether that's a +2 or +2000 bonus. - If the Swamplands are part of no bonus, why are they colored identically to the motherland they are adjacent to? Perhaps "cut them out" and make them a more neutral gray? - Canoe-1 and Canoe-2 make me think of decays when you're just trying to name them. I don't think hyphens are necessary. - The Spanish Fort's "part of no bonus" seems unnecessary since it holds no tribal symbols and has its own noted bonus in the legend. That, and its color isn't remotely like any other region's. - This may be just my flavoring, but the positioning of "Take over the Spanish Fort..." is terrible. 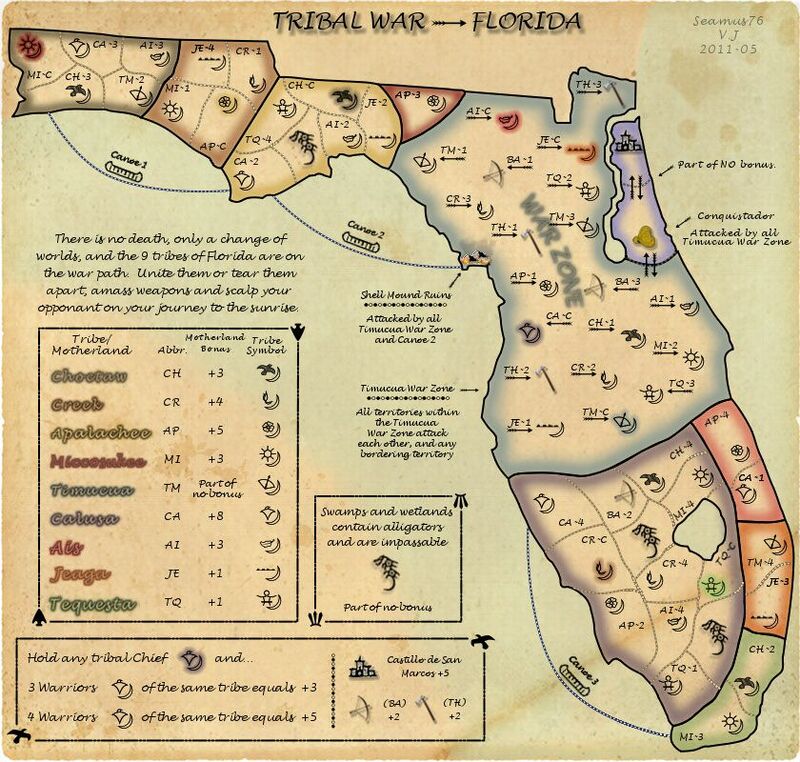 After a terrific paragraph establishing the flavor of your map, it gets undercut by noting that the Indian tribes aren't worth squat unless they have modern weaponry. Not what I think you meant. Perhaps relocate that phrase if you want to keep it, but I don't think it necessary at all. - Finally, when are you going to make a pimptastic title for the map? You've got plenty of space to put one, have at it. I'm a glutton for punishment!! Thanks for the feedback. Let me work through these and make the necessary updates or comments. The outer glow on the tribes is too strong. While you're meaning to make them easier to read in a lot of cases it works against the script. Perhaps try fewer pixels in radius or a lighter color than black? When you say the outer glow on the tribes I'm not sure what are you are specifically referring to. Is it the colored border around all of the regions/motherlands? Is it the colored borders around the tribal chief symbols? Then you mention using a color other than black, does that mean the black outline of the regions/motherlands, or each actual tribe symbol? Sorry for my confusion, I'm just trying to understand so I can potentially fix the problem. he's talking about the tribe names in the legend. i say leave the size and colour of the glow and just reduce its opacity to 50-60%. Thanks Dim, that should be easy enough. Thanks shakeycat, i'm working on an update now. not sure it will include a pimptastic title just yet, but these are much appreciated. I love the arrow, I was thinking about some kind of tomahawk but that might be easier. Thanks so much. For this update I kept the gameplay the same as the previous version and only played with the colors of the tribe/motherland names, which was based on some good feedback, and I agree, it looks better and is easier on the eyes. The title has also been enlarged, but is still being worked on. From a gameplay standpoint, I included two additional versions, v.3.9-b, which has the same updates as v.3.9, but makes the swamps and wetlands (alligators) impassable rather than decay. I also changed one of the locations, swapping it with CA-2. For v.3.9c I completely removed the swamps and wetlands, and replaced them with 1 bow and arrow, and 1 tomahawk. Both of these were placed in the War Zone, and 2 warriors were put in the alligators spots. Please let me know if there are any ideas or preferences when it comes to these versions, or a good course of action. I think the new 'pimptastic' title with the arrow looks pretty fine, though maybe with a slightly bigger arrow. Thanks Andy,the next version will include a larger arrow. On a side note, what's a guy gotta do to get some gameplay feedback, make 4 versions? Please check out the first post and let me know some thoughts on the different gamplay options. I think you should have the alligators included as impassables. The only thing is maybe you could add in one or two more of them, and don't forget to make sure they are facing the same way as you show in the legend. When you do the impassables, make them a different color, or whatever as to differentiate them from the bonus regions. In this way we can look at the map and boom, there are the impassables! Seamus76 wrote: Thanks Andy,the next version will include a larger arrow. Sometimes directing us (as you have done now), or quoting something you would like specific feedback on, can help spur the populous. This updated builds upon the last version, v.3.9-b, which made the swamps/alligators impassible rather than decay. I added one more swamp and moved TM-3 to the War Zone. I also experimented with different textures, and colors for the background of those spaces as well as a potential glows on the alligators, but nothing looked right with the current colors, and actually detracted from the clarity so I left them as is. The fact that there will be no army circle or numbers on those will help differentiate them from any non-impassable territory. In the header description I removed the line about the Spanish Fort, which gave me a little room to make that larger and more clear. I also added back the "Conquistador" label on the right side, just so that it wasn't hanging out there with no explanation at all. So what does everyone think of the new version? I believe isaiah's suggestion of changing the colors of the impassables to be obviously different would be good. Perhaps gray and change the Mikkosucci (I think, more on that in a sec) to a different more vibrant title? The title doesn't have that Pop that establishes a map's name. It's more like a subtitle at present. Use all of the space you've got up there, add some color perhaps. Make us think beyond a shadow of a doubt that this is Tribal War. I say this as a guy who put a LOT of stock into my title of Research & Conquer. It set the mood for the rest of the map. Finally, while your tribe names in the legend are easier to see, they still could use a little work. The darker tribe name matched with the semi-opaque black doesn't work well. Perhaps change the shadow color to a brighter color like white or creme yellow (Photoshop's default for Outer Glow, for reference)? With the impassable, how about filling the whole territ with that regions colour (the one that is going around). Saythe colours that go around the borders of the regions, some of them touch the black lines and some seem to have a pixel or 2 spacing. Is this intentional or are my eyes playing tricks on me? As TaCktiX said, the legend names are hard to see. When you add the soft glow to the writing, came back in to the original and delete all of the black, so it only goes around the outside and does not fill the inside up. Also, make the font a tad larger, that should make it more than readable. Hope the numbers work out. Be good to see them on. TaCktiX wrote: The title doesn't have that Pop that establishes a map's name. It's more like a subtitle at present. Use all of the space you've got up there, add some color perhaps. Make us think beyond a shadow of a doubt that this is Tribal War. I totally agree, when I came to check on this map the first thing I noticed was what the title was not setting the theme of the map. You have loads of real estate up their to utilise. Make an awesome title that pulls the theme of the map together. Thanks guys, have been working on the next update, which will hopefully address those issues.